Following my Call to Arms, a number of you responded by sharing with me your book marketing experience. I now have about a hundred responses by some fifty authors. Although some of the responses were expected, there were quite a few surprises in there for me. For anyone wishing to take a look at the raw data, you can download this Excel spreadsheet. I grouped the results according to whether the book was offered full-price, discounted or free. I also have a fourth category titled Other, that includes any entries where this was not specified. To compare the various ad media, I came up with a number that represents the ratio between number of sales and cost of advertising. In other word, if you spent $1 and had one sale, then this number would be one. If you spent $1 and had two sales, the number would be two, etc. I think that many people don’t believe that a Third World War is in the cards, I’m not so sure. I can tell you that Utopia will never happen. Why? Simple, there will always be that one person with brilliance, charisma and agenda, and their agenda is to rule the world. A super villain. They don’t just exist in comic books and novels, they are real. That’s why we writers create them and use them. I’m watching the news and there are so many people with different ideas about what is right and what is wrong and so many are based on their religious ideologies. One reason I split most of my colonies into religious based groups is because it seems that’s how most people would choose to follow, their faith. Not everyone, but most would. Their church is their community and their home away from home. I watch Christians who are under attack by non-religious groups, but then I see Christians attacking equal rights for the homosexuals living in the USA. I see anti-Semitic rhetoric and I see the attacks on peaceful Muslims. Across the board, a zealot is a zealot and a distortion of your deity’s teachings can create a cataclysm. Iran’s president, Mahmoud Ahmadinejad, stated in that he would not rest until the West was under one God… he meant his god. The absolute fascism of dictatorship, deciding for the people what is best for them. Forcing ones ideologies on others. We’ve seen this before, twice it led to a World War and in other instances the death of millions, destruction of countries and freedoms that have yet to be re-established. These people exist right now. They are in our back yard, in our neighborhoods and in our churches. They are Muslim, and Christian and Jew and Atheist. They are everyone who cannot be tolerant of another person’s opinions and beliefs. We are all different and yet all the same. Is World War III ready to come? All the time. Look around and take notice. I can’t tell you how it will happen or if it will happen in out lifetime, but the seeds are being sown everyday. Will it be fought with Sound weapons and Bio warfare? Maybe… or maybe it will be fought with nuclear weapons, destroying everything. Maybe it will be fought with guns. Who knows? The point is, as long as we are vigilant and strive to be caring and thoughtful and tolerant, we might be able to stop it and until then, we’ll write books where we can teach the people there how to be more tolerant. While researching places and mythology for my book, The Gathering: Book One of the Lia Fail Chronicles, I came across a lot of interesting facts about the Celts, Ireland, Magik and even Los Angeles. Having been raised in Los Angeles, it was great to learn new things about my home, but I was even more intrigued to discover so much information about the Celts. The ancient Celts believed they were descended from the Tuatha Du Danann. A “god-like” or fae people (fae being fairy like) who had arrived in Ireland for a mythical land. There are several articles online that I have read and these people claim to have read and re-read ancient Celtic texts and they often discuss how these texts often contradict themselves. I have read what they have to say and I have come to my own conclusions. 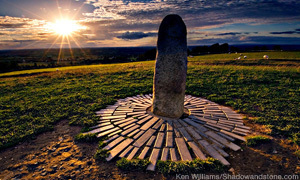 Lia Fail (the Stone of Destiny) is often referred to as the Coronation Stone or Jacob’s Pillar. It is connected to the Kings of Israel and supposedly found it’s way to Briton when an Israeli princess was married to a British King. That stone is currently in Westminster Abbey; well, according to those passionate about it on the internet. And I don’t think that the Coronation Stone and Jacob’s Pillar are the same stone. The Pillar is in County Meath at Tara and is believed to be the Danann Stone. The Coronation Stone, at the Abbey, is the Israeli stone. There is great debate over the Coronation Stone. Does it belong back in Israel of today? The Scots have laid claim to it… should it stay in England, after all, it’s been there for quite some time. Not sure, but I do not believe that Jacob’s Pillar, the Coronation Stone, is the “real” Lai Fail. 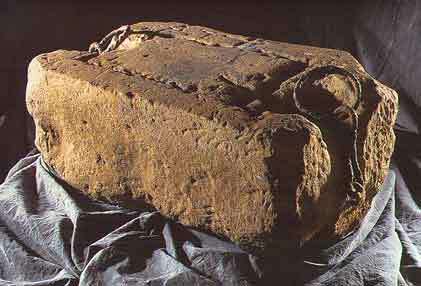 Lia Fail, the Stone of Destiny, was believed to be brought by the Tuatha Du Danann when they arrived in Ireland. It was held as sacred and protected. It was often said that when one touched the Lai Fail, it would roar. When you look a little deeper you see that Lia Fail actually seems to translate into something like a “keeper of the sacred knowledge”. Maybe it was a book or stone that held the secrets of the Danann. Unfortunately, we will most likely never know for certain, as it is thought that the original Lia Fail disappeared many, many years ago. Maybe, the Fail was just a representation of the wisdom of the magical people of the Danann… maybe its just an idea, or a way of being. Either way, I was inspired enough by the concept of the stone to name the main village of my stories after the mystical stone of the people of my ancestors… Lia Fail. I would like to think that the knowledge and magik of the Tuatha Du Danann might be here now. Searching near and far to find those that believe… after all, magik is everywhere. A while back my friend Magen McMinimy tagged me to do a post about my dream cast for my book The Gathering: Book One of the Lia Fail Chronicles and then tag 5 authors to do the same, and in typical “Shannon Fashion”, I dropped the ball. So now Author Michael Loring has come up with something similar, but instead of with a dream cast you have to share FIVE facts about your book that no one else would know, followed by tagging four other authors to do the same with their book of choice! A very simple game, but nonetheless fun! Moments that make your heart flutter. Scenes that have you holding your breath. Coveted admissions of love that you just can’t wait to be confessed. This is a collection of stories that center on matters of the heart, overwhelming feelings of love, and stories that make you stop to re-read those breathtaking moments between your favorite characters. Be it the angst, the turmoil, or the first kiss, these are stories that speak to your soul and warm you to your core. Eleven authors, eleven stories, eleven special moments—brought to you with ALL OUR LOVE. 1. It took eight and a half years to write and publish The Gathering. 2. The Merganser family was originally named the Mortaver, Madison was originally Tuner, Brian was originally Grant (named after his godfather) and Paul was originally named Ian. 3. Vance and Stephan were originally slated for death. 4. I had no idea how it was going to end when I began writing it. 5. The Gathering was originally slated to be 3 individual books, now it’s the first in a series of a minimum of 4 novels and so far 3 compendiums and a Diary full or prequel. Ok, now go forth and let’s learn and tag… you’re it!!! Next Big Thing Blog Hop!! Well, I did this a while back, but was asked to participate again and Lo and Behold, I do have a new work about to come out… So, Thank you, Penelope Anne Bartottp at The Library at the End of the Universe (http://libraryendofuniverse.blogspot.com/). She and I will each have stories featured in a new anthology by Cynthia Shepp (http://cynthiashepp.wordpress.com/ ). Paranormal Anthology with a Twist will be available VERY soon!! You can read about my story Bloodlines below!! Q. Where did the idea come from for the book? Cynthia started a contest in September, 2011 where her readers, and several authors she knows, submitted short stories based on a specific set of prompts, there were winners chosen and 11 stories were chosen to be in an anthology (Apocalypse: An Anthology by Readers and Authors). She opted to continue the contest, which has become one of my greatest inspirations. Q. What genre does your book fall under? This book would fall under Paranormal – thrillers maybe… I haven’t read all the stories yet!! Q. What is the one-sentence synopsis of your book?When two children escape the clutches of the Gestapo, they learn more about themselves then they ever thought possible. eQ. Will your book be Indie published or represented by an agency? It will be published independently. Q. What other books would you compare this story to within your genre? Hmmm, not sure I’ve read anything like my story, but the compilation will more than likely be a representation of several books. Q. Who or what inspired you to write this story? Cynthia and my fascination with WW2.